This page was last updated on 21 October 2004. 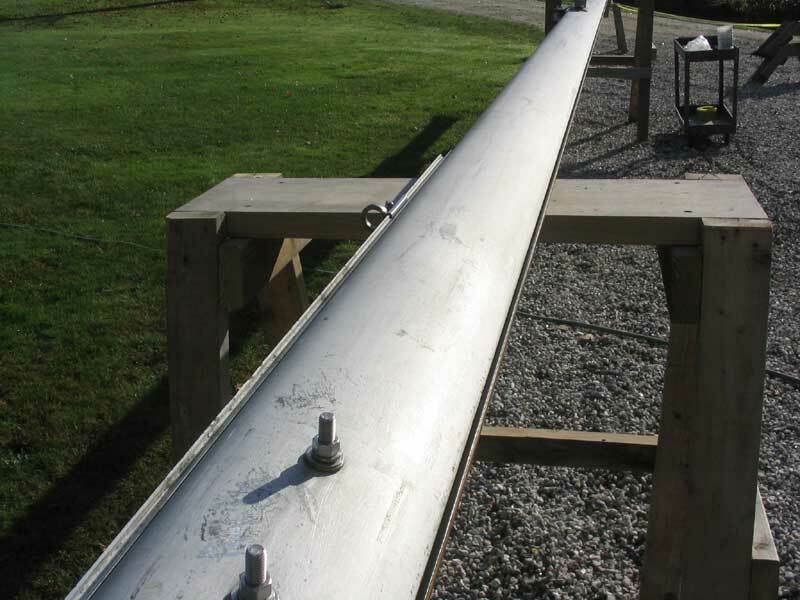 During the initial stages of my restoration project in 2000-2001, I anticipated painting the original mast. However, with time running out--and after discovering that scrubbing the aluminum with detergent and a Scotch-Brite pad made a drastic improvement in its appearance--I elected at that time to forgo the mast painting, at least for the time being. Each season, I would once again reconsider the prospect, only to have it go by the wayside for one reason or another--most importantly, perhaps, because the mast just didn't look that bad. In 2004, for a variety of reasons, I decided to replace the boom. 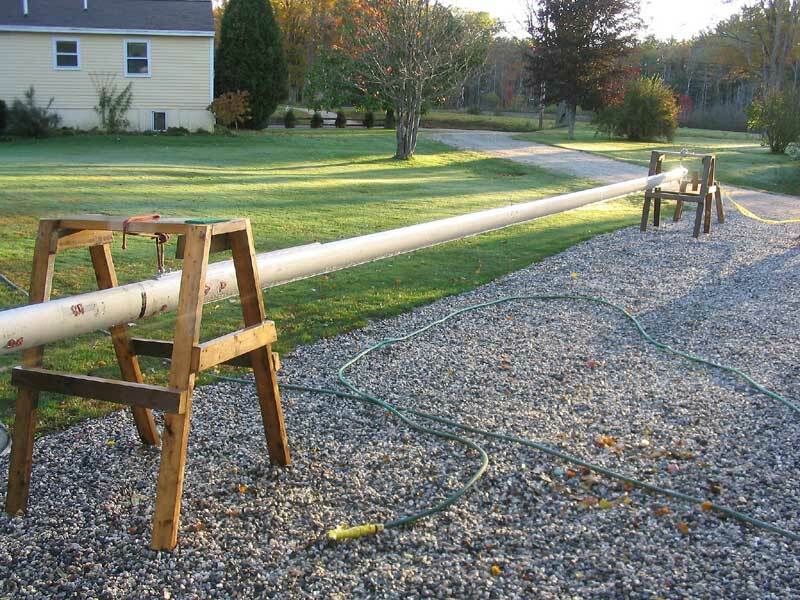 I elected to buy the boom unpainted and untreated, so I was faced with a decision: if I painted the boom white, my first choice, I would essentially commit myself to painting the mast to match. 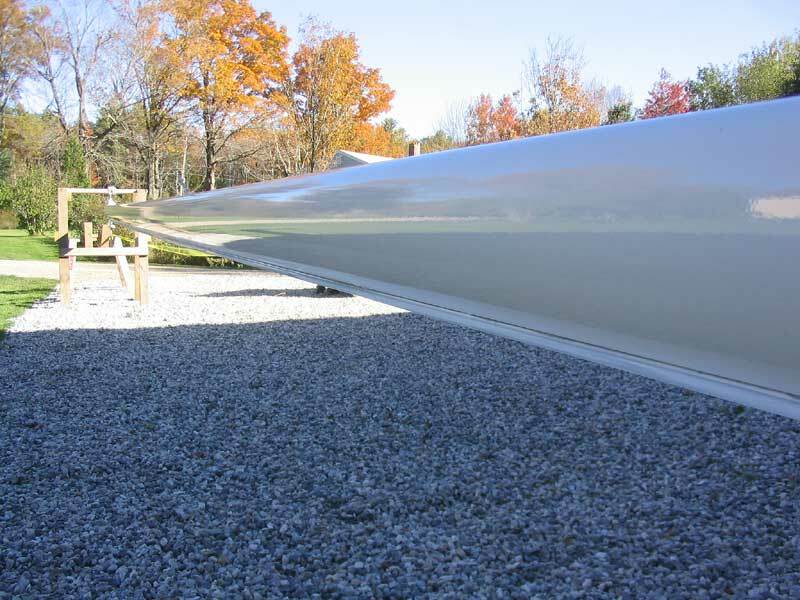 Eventually, I went ahead with the white paint, and therefore made plans to take care of the mast in the fall, as soon as the boat had been hauled. After much consideration, I decided to proceed using the same basic Awlgrip-supplied methodology as I had used when painting the boom earlier in the season: the one-day process that included a variety of etching chemicals, zinc chromate primer, and final topcoats, all applied in a single day. As an additional challenge, I had to do the work outside, as there simply wasn't any convenient way to get the mast inside the shop in any manner that would allow this sort of work. Obviously, I should have heeded Heidi's advice and built a bigger shop--but I have the feeling that if I had, somehow I still would have had too much stuff inside! I began by stripping as much hardware off the mast as I could. 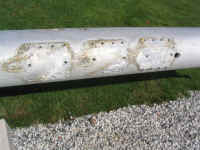 I left the mast base and masthead castings in place, partially because the screws that held them in were reluctant to move. Also, I needed a means of suspending the mast, and it made sense to use the jumper tangs at the masthead. Just by looking at it, I could tell that the spinnaker pole track (original) was not going to come off without a fight, so I left it in place; again, this proved to be helpful, as I used the eye in the car to suspend the lower end of the mast during painting. I also found that removing the mainsail track (bronze), while theoretically possible, was going to be near impossible. After testing a number of the screws holding it in place, I determined that it was not worth the effort to remove it. 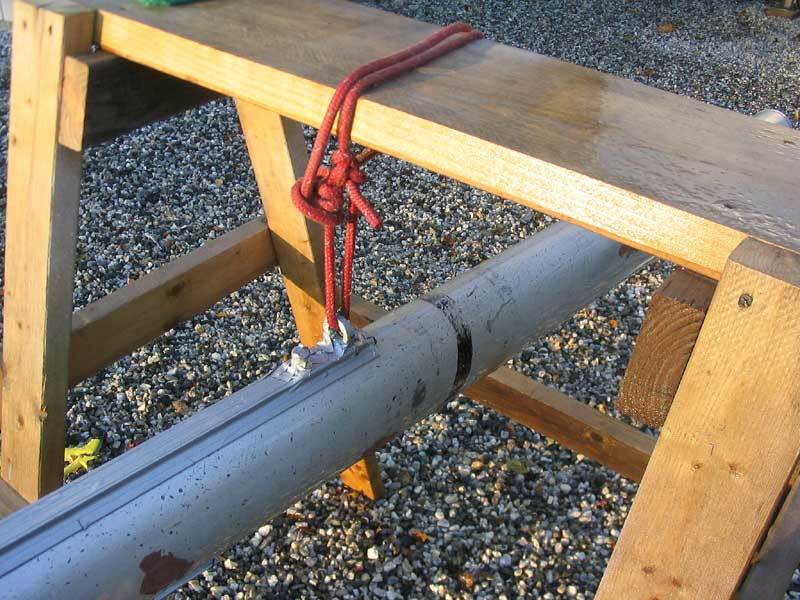 My mast had three stainless steel tangs secured at the headstay hounds: one (lowermost) for the genoa halyard block, another (mid) for the headstay, and a final one (top) for the spinnaker halyard block. Because each tang overlapped the one beneath, I had to begin at the top. However, the top tang, for whatever reason, was secured with rivets, while the lower two featured machine screws. I ground the heads off the rivets with my angle grinder, and then successfully remove the top tang, which opened up access to easily remove the lower two. There was obvious corrosion beneath the three tangs, but it looked far worse at first glance than it did once I had cleaned off the powdery residue. 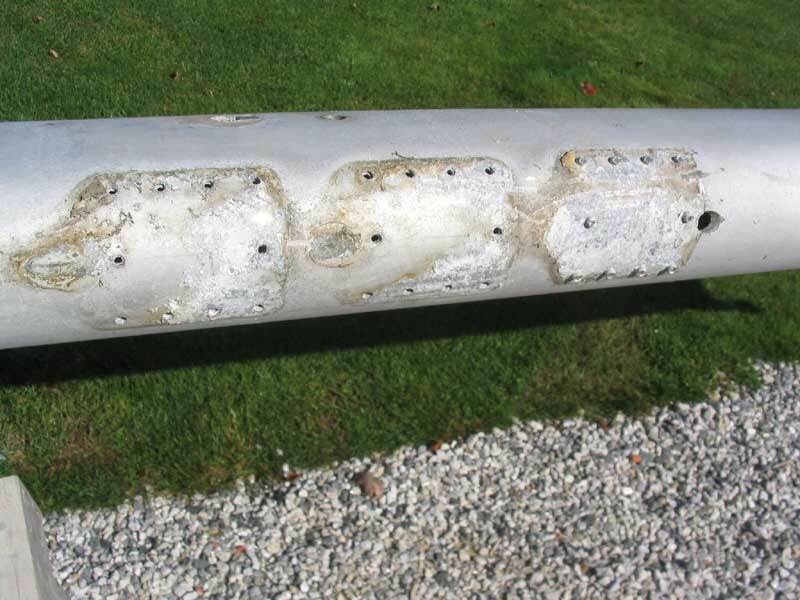 My next step was to identify and then fill with epoxy all unneeded holes in the mast. I substantially overfilled each hole with thickened epoxy and let it cure. Then I endured a period of several days where the weather would not cooperate. Finally, the forecast indicated a near perfect day for Wednesday, October 13, so I prepared in advance for what I knew would be a busy day by laying out tools, painting supplies, and spray equipment. I also masked off the areas that I did not want painted: masthead and base, spinnaker track, and mainsail track. Because I had, for years, sprayed silicone lubricating spray on the mainsail track, I found I had to solvent wash it in order to get the tape to stick, but it seemed to do the trick. I used 3M #225 silver tape. Early in the day on Wednesday, before the sun had risen above the trees to the east, I began preparations by washing the mast with commercial degreaser and a Scotch-Brite pad. I scrubbed the entire surface and rinsed well, then removed the bulk of the water with towels and left the mast to dry on its own once the sun came up. When the mast was dry, I spot-sanded all the epoxy patches, using 120 grit on my 5" DA. Then, I sanded the entire mast surface just to sort of break the surface, using first 120, then 220 grits. In this area, I broke with the Awlgrip instructions. Since I didn't feel the mast required any surfacing or major filling, I decided that there was no reason to proceed with coarse sandpaper grits and multiple primer coats, all of which would require at least a couple additional days to complete. With weather closing in on me, and some indelible time constraints, I couldn't afford that sort of time. 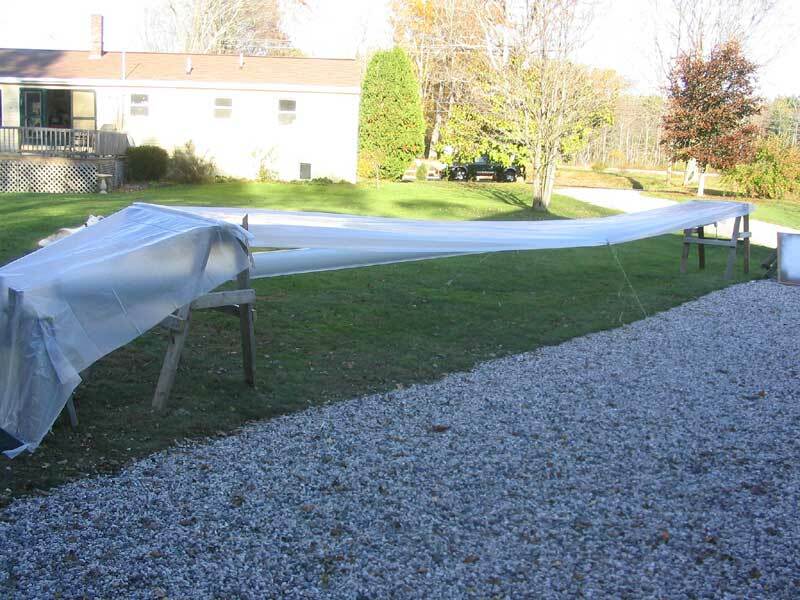 I discovered that the tape on the mainsail track--over 100' worth--had trapped significant amounts of water from the dew and washing, and had become a soggy, limp mess. I had to pull it all off, annoyingly. Sanding complete, I vacuumed off the mast to remove the bulk of the dust, and then moved on to the next steps: chemical etching, using Alumiprep 33, and application of the chemical corrosion treatment Alodine 1201. 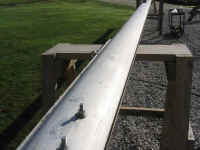 With a Scotch-Brite pad, I applied the Alumiprep, scrubbing the surface over a several foot-long area and then rinsing; the mast was in direct sunlight, and it was important to not allow the chemical to dry on the surface. As soon as the etching was complete, I continued by applying the Alodine; I used a cheap brush to apply it as directed, and then rinsed it off. With that, I left the mast to dry thoroughly before continuing, using the airflow from my HVLP turbine to help blow water out of the screwholes and, in particular, away from the mast track. Fortunately, drying conditions on this day were superb, with light breezes, bright, cloudless sun, and warm temperatures. Later, when the mast had once again dried, I reapplied masking tape to the mainsail track, and checked the remaining tape for damage from water or sanding. Then, I spray-applied a coat of Awlgrip 30-Y-94 yellow anticorrosive primer and let it cure for about two hours. By now, it was close to noontime, and I wanted my topcoats complete before 1400. When the primer had cured sufficiently, I continued by spraying the first of three coats of Awlgrip Snow White. Then I applied the final two coats, waiting about 30 minutes between coats as prescribed. I was finished with spraying at around 1330, and was pleased that the job was complete. It seemed like plenty of time for the paint to cure before nightfall, and I was very happy with the quality of the paint job--smooth, glossy, and only one or two small runs, all at the lower end where the mast was suspended through the middle of the horse, making access with the spray gun a little difficult; this resulted in the gun overloading one or two areas slightly, which caused the runs. No big deal. Imagine my disappointment when, passing by the mast the next morning on the way to the shop, I noticed that it looked funny. A closer inspection revealed that the paint had gone completely flat, obviously from dewfall. It was apparent that, despite all former appearances, the paint had not sufficiently cured before dusk fell the previous day, and the dew had ruined the paint job. Although I knew about this potential pitfall, I had really felt confident that I had finished early enough in the day to prevent the problem, but obviously not. Part of the problem may have been caused by my choice of reducer: since my HVLP turbine warms the air, I had found during earlier Awlgrip jobs that the paint tended to orange peel, which is caused by the reducer flashing off more quickly than the time it takes for the paint to level for that perfectly smooth surface. As a result, I had begun using the slowest Awlgrip reducer, T0005 (hot weather), and this had worked like a charm when I painted the boom. Perhaps now, though, it had slowed the curing sufficiently that 5 hours was not enough. I was still learning the spraying process, and the intricacies thereunto. In any event, I was disappointed: but life goes on. After a couple days, I sanded the mast with 220 grit paper to prepare the surface for recoating as soon as the weather allowed. It was exactly a week later that the weather forecast looked like it might allow me to recoat the mast. Since I had been watching the forecast anxiously, I was prepared. 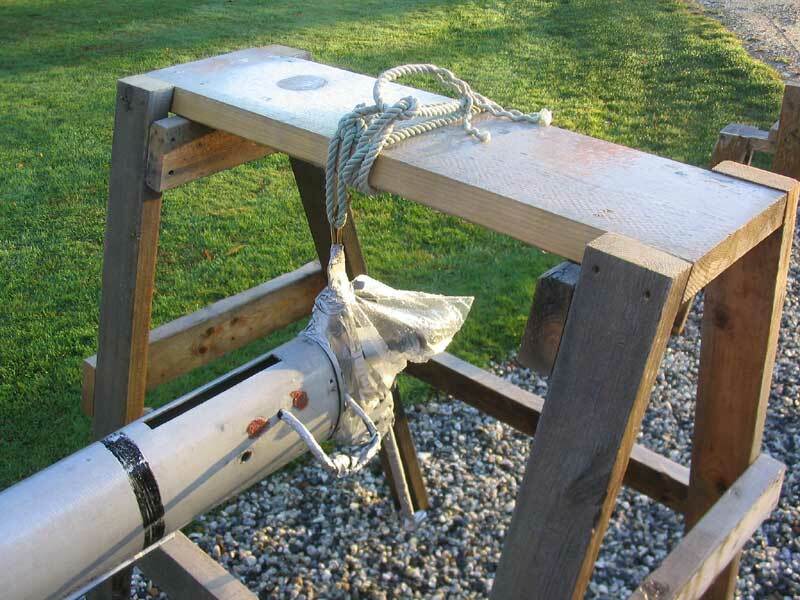 To avoid a repeat of the problems above, I spent an hour or so on the day before my anticipated recoating weather window to prepare a plastic cover for the mast, which I could deploy over the painted spar late in the day to prevent any dew from falling onto it. I used a length of 4' x 50' plastic sheeting, which I ran between the two horses supporting the mast. To allow the sheet to be tensioned enough to stay clear of the mast, I wrapped each end around a strip of wood several times, and then stapled it in place onto the strips; by screwing these strips into the tops of the horses, I could tension the sheeting sufficiently without tearing the plastic. Once I was satisfied that the idea would work, I rolled up the arrangement to one end, where I left it at the ready for when it was needed. I also masked off the various portions of the mast that were not to be painted, as before; I had removed all the tape from the previous paint job. Wednesday, one week after the initial painting, dawned clear and cold, but windy; I was concerned that I would not be able to paint after all. 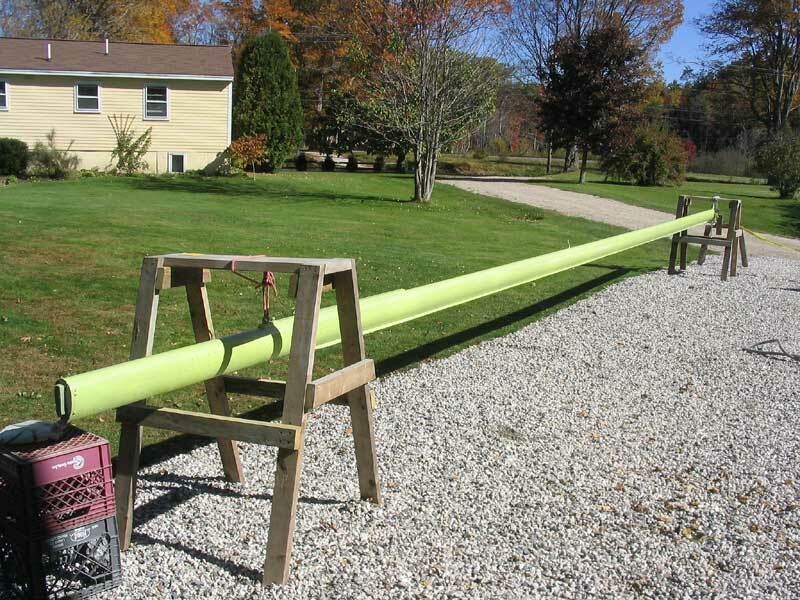 By 1000, though, I decided that the wind was not much of an issue after all, and knew that it was sort of now or never if I wanted the mast to get painted this fall. I really did not want the project to linger any further, as I knew it would be a challenge again in the spring to get it done. Therefore, I pressed onward. With one final cleaning with Awl Prep solvent, I prepared the day's batch of snow white Awlgrip and, by 1030, had sprayed the first coat. Since I had such a good base, I figured two coats would be more than sufficient. The first coat came out well, with one minor run that I was able to smooth with a brush before it cured. 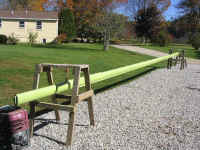 45 minutes later, I sprayed the second, and final, coat, and left the mast to cure the rest of the day in the sunlight. For this batch of paint, I used the standard reducer, Awlgrip T0003, which would allow the surface to cure faster. 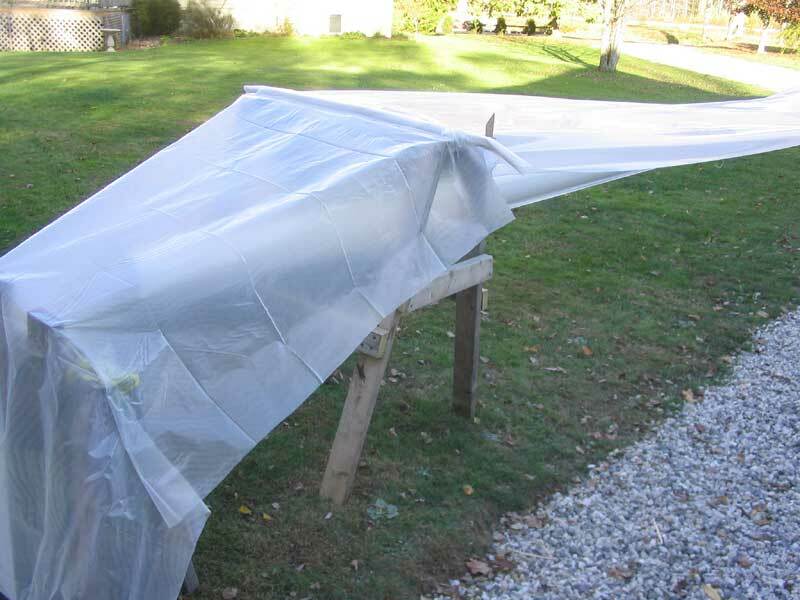 Late in the day, the surface was tack-free, and I took the opportunity to roll out my plastic cover. 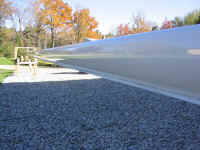 Being careful to avoid touching the mast surface, I unrolled the plastic and secured it tightly in place, as described above. This stretched the plastic enough to keep it off the mast, but I added extra staples (reinforced with cardboard strips) to add extra tension to the plastic edges. 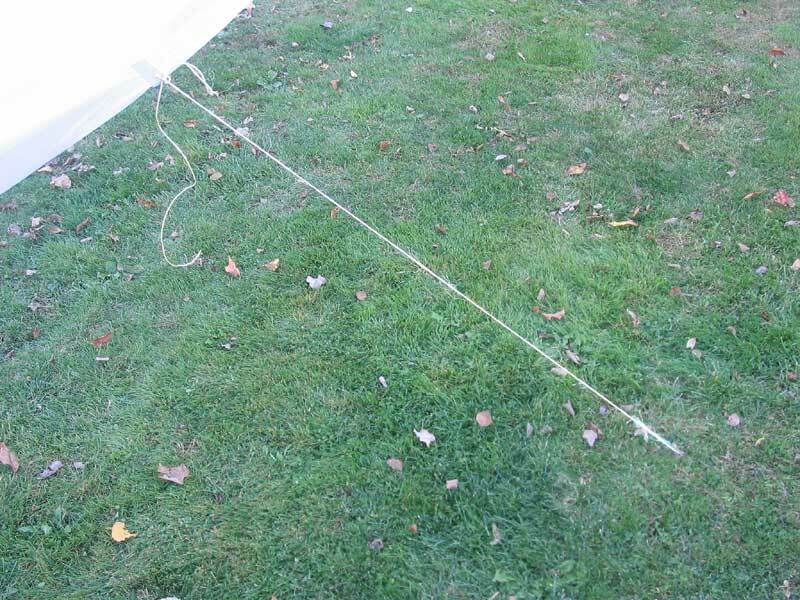 The wind had lightened, but some gusts that swept through showed the need to secure the center portion of the plastic somehow; I used some small string to secure the edges of the plastic (reinforced with duct tape) to a p air of tent stakes, one on each side, that I drove into the ground. 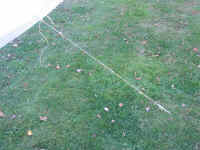 I didn't tighten these strings much--just enough to hold the plastic down when the gusts came. I didn't want to pull the plastic down onto the spar. Finally, I added an additional piece of loose plastic at the base of the mast, which protruded beyond the horse. I simply stapled it in place between the main horse and a smaller one, and further secured it by throwing a stack of roofing shingles on top of the plastic to prevent the smaller horse from tipping over. There was nothing more I could do. It seemed like I had taken the proper precautions, but only the next morning would tell. Amazingly, even my efforts above failed. 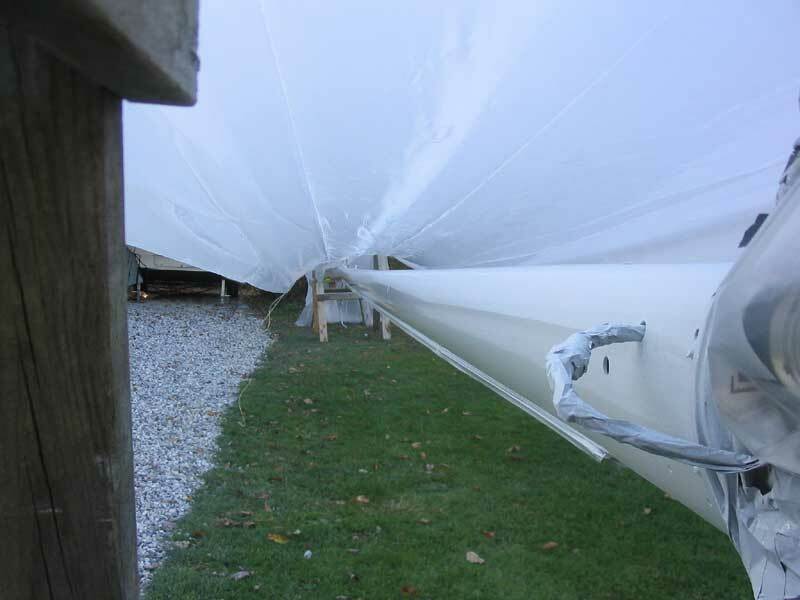 Somehow, frost managed to form on portions of the mast overnight, even under the cover. Some areas were completely unaffected, and remained glossy; other areas were ruined. How did this happen? I noted that the underside of the plastic, even, was coated with frost. I thought frost was frozen dew; how did dew get there? To say that this was an irritating setback would be an understatement. In any event, this job was over for the fall. There was obviously no point in a third attempt. I knew it was risky to try the job outdoors so late in the season, but it seemed I had done what I could to make it worthwhile. Perhaps the time will have to come this winter for me to shoehorn the mast into the shop somehow, and get this paint done right. Maybe I should have just painted the thing with Dutch Boy house paint instead. For all my efforts, it about looked like I had. Alumiprep/Alodine 1201 Application: 30 min. Primer (30-Y-94): Mix 14 oz. base, 14 oz, converter, 14 oz. reducer (1:1:1) Comments: Way too much. I had about 32 mixed ounces left over. Topcoat (Snow White): Mix 12 oz. base, 12 oz. converter, 6 oz. reducer (1:1; 25%) Comments: Perfect amount for three sprayed coats. Topcoat (Snow White): Mix 12 oz. base, 12 oz. converter, 6 oz. reducer (1:1; 25%) Comments: Small amount left over. I thought I was mixing less than the first time around, but it turned out it was the same. 1 gallon Dutch Boy latex ($9.99) and 30 minutes of my time, glopping on the paint with the broom I use to sweep my shop. Life goes on, however. Like all setbacks, I fell back, regrouped, and atttacked again later. To continue the project, please click here.